Infinix Hot 6 Pro VS Infinix Note 5: which of the 2018 Infinix smartphones will you buy? 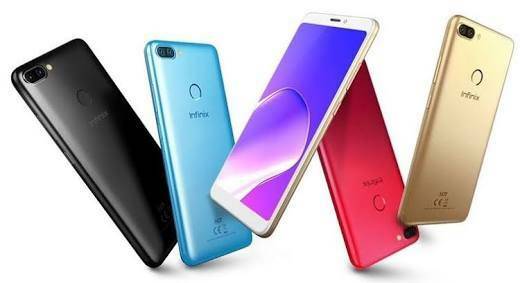 Infinix Hot 6 Pro VS Infinix Note 5: which of the 2018 Infinix smartphones will you buy? In this comparison article, we’ll be looking at two smartphones from Infinix Mobility. The Infinix Hot 6 Pro and the Infinix Note 5 were announced this year, featuring the most trending specs and features. The Note series is Infinix’s best series so far based on popularity and features it possess. But that doesn’t mean the Infinix Note 5 is better than the Infinix Hot 6 Pro. Well, we can’t really say without comparing the specs and features of the Infinix Hot 6 Pro with the Infinix Note 5. The Infinix Hot 6 Pro is the bigger version of the Infinix Hot 6. The Hot 6 Pro features a dual rear camera and a Snapdragon chipset, which is not something you see in everyday Infinix smartphones. So let’s see who wins this comparison battle between the Infinix Hot 6 Pro and the Infinix Note 5. The Infinix Hot 6 Pro and Note 5 features a front glass with polycarbonate unibody. The Infinix Note 5 joins the Hot 6 Pro in featuring a rear-mounted fingerprint sensor. The Infinix Hot 6 Pro packs a dual rear camera that’s aligned at the top left corner in a horizontal direction. While the Infinix Note 5 packs a single rear camera at the top left corner. Aside from the expensive Infinix Zero 5, the Infinix Hot 6 and 6 Pro are the only Infinix’s smartphones with dual rear cameras. The Infinix Hot 6 Pro weighs just 145 grams and measures 7.8mm in thickness while the Infinix Note 5 weighs 173 grams with 8.4mm in thickness. In terms of body colors; the Infinix Hot 6 Pro is available in Sandstone Black, Magic Gold, Bordeaux Red and City Blue body colors. While the Infinix Note 5 is only available in Black, Blue and Grey body colors. The Infinix Hot 6 Pro sports a 6.0 inch HD+ IPS LCD touchscreen while the Note 5 sports a 6.0 inch Full View HD+ IPS LCD touchscreen. But the Infinix Hot 6 Pro comes up short in the display features. The Infinix Note 5 packs a 1080 x 2160 pixels resolution, an 18:9 aspect ratio, 79% screen-to-body ratio and 402 pixels per inch density. While the Infinix Hot 6 Pro packs a 720 x 1440 pixels resolution, an 18:9 aspect ratio with 282 pixels per inch density. The dual rear camera on the Infinix Hot 6 Pro consist of a 13MP primary sensor and a 2MP secondary sensor with LED flash. While the Infinix Note 5’s rear camera features a 12MP sensor. The dual rear camera of the Hot 6 Pro will help in autofocus, bokeh and portrait modes. Up front, the Infinix Hot 6 Pro sports a 5MP front-facing camera while the Infinix Note 5 packs a 16MP front-facing camera. Overall, the Infinix Note 5 features better camera specs than the Hot 6 Pro. I think the highlight of the Infinix Hot 6 Pro is the Qualcomm Snapdragon 425 chipset and Adreno 308 graphics processing unit that powers it along with 4-cores processor clocked at 1.4GHz. While powering the Infinix Note 5 is MediaTek Helio P23 chipset, an 8-core processor clocked at 2.0GHz and Mali-G71 MP2 graphics processing unit. The Infinix Note 5 runs on pure stock Android 8.1 Oreo with 3GB memory and 32GB internal storage. While the Infinix Hot 6 Pro runs on XOS 3.3 hummingbird skin on top Android 8.0 Oreo with 2/3GB memory and 16/32GB storage. Powering the Infinix Hot 6 Pro is a non-removable Li-lon 4000 mAh battery while the Infinix Note 5 is powered by a bigger non-removable Li-Po 4500 mAh battery. The Infinix Hot 6 Pro is sold for about $162 (N56,700) while the Infinix Note 5 is sold for about $183 (N64,050). There’s obviously no department where the Infinix Hot 6 Pro outclassed the Note 5. Even in its highlight departments, such as camera and hardware, the Note 5 features a better camera quality and quality hardware than the Hot 6 Pro. The Infinix Note 5 features no customization on its Android 8.1 Oreo and will be free from bloatware.